Dennis Quinn’s on-air broadcast career spans five decades in New York City radio. As an on-air personality he has hosted programs in formats ranging from top 40 to Disco, AOR to Love Songs on WPIX-FM. In 1988 he segued to Smooth Jazz on CD101.9. In 1970 he created ‘Rapline’ which combined call ‘ in Talk Radio with rock and pop music. In-studio guests ranged from Neil Sedaka and Andy Williams to Bill Withers, Chuck Berry, and Alice Cooper. Off-air he has produced numerous radio documentaries including, ‘Still Rolling, ‘an award winning Rolling Stones audio documentary. He has held administrative posts including program director, public service director and production director. He has been an AFTRA shop steward for twenty-five years. Dennis is also a performance artist. With his group ‘Warp Spasm’ he performs stories in a genre-bending mix of radio drama, music, and spoken word. Academically he was an adjunct professor at Fairfield University for five years. He created the syllabi for three courses that helped transition Fairfield’s ‘New Media; Film, Television and Radio ‘program from a minor to a major. 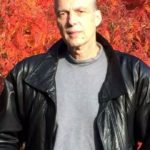 He was the creator and executive producer of Fairfield University’s audio magazine, ‘Buzz.’ In 2007 his course ‘Early Radio and the American Identity’ was selected by Yale as part of its prestigious, Residential College Lecture Series. In the fall of 2008 Dennis became a full time assistant professor at Hofstra University and In the fall of 2014 he was promoted to associate professor. He teaches various radio courses in the Radio, Television, and Film Department of the School of Communication.He is the Radio Area Coordinator and creator, executive producer, and General Manager of Hofstra’s Podcast Network – Required Radio. On this edition of Coast to Coast Football, hosts Matt and Zevan give an in-depth review of every single game in Week 9 of the NFL season. They also give their updated power rankings as of the beginning of Week 10. For more, keep it locked into Required Radio at requiredradio.com. On this episode of Coast to Coast Football, Matt and Zevan preview every single Week 9 NFL game. They also give their predictions of every single score on Sunday and Monday. For more, keep it locked into Required Radio at requiredradio.com. On this episode of Coast to Coast Football, Matt and Zevan both give you in-depth analysis of every single NFL game in Week 8. For more, keep it locked into Required Radio at requiredradio.com. For fans of football who are not all that into fantasy, Required Radio’s newest show is what you’re looking for! Join hosts Zevan Shuster and Matt Novella as they take you around the NFL and discuss all of the hot topics and talking points about all 32 teams. For more, keep it locked into Required Radio at requiredradio.com. On this episode of Life’s A Pitch, Gabe has his friend Michael on and a couple of other people from his own fantasy baseball league to talk about this week’s hot topics in fantasy baseball. For more, keep it locked into Required Radio at requiredradio.com. 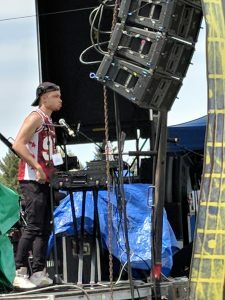 Hofstra’s Music Fest was an exciting time for everyone that showed up there. Hofstra Concerts put together a great show and tactfully organized 5 separate acts.The performers were Aaron West, The Last Great Kings, CRUISR, Kirk Knight, and the headliner was PVRIS. The most notable performance for Hofstra students was Battle for Music Fest Winners “The Last Great Kings”. “The Last Great Kings”, like most college bands, were very humble and were excited to perform at their biggest venue yet in their young careers. Their lead guitarist, Tommy O’Connor, was able to give Required Radio a minute to talk about the scale of this performance, “This is miles different from anything we’ve ever done… we’re not used to having other people help us set up; when we brought our equipment and people were like, ‘no we’ll take that for you’, it was a big thing and we were like, ‘no we can do it’, and they said, ‘no let us help you…it’s the professionalism, it’s just like…I feel like a real band”. After The Last Great Kings’ performance, CRUISR came up to rock the stage. The gave a shout out to headliner PVRIS, with their lead guitarist and vocalist Andy States saying how the two bands are really good friends. 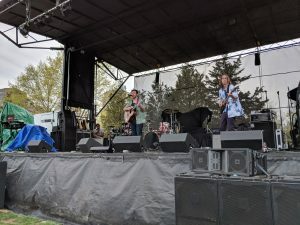 Guitarist Bruno Catrambone elaborated on their relationship, telling Required Radio, “Yeah…they’re really cool, we toured with them and became friends as a result”. 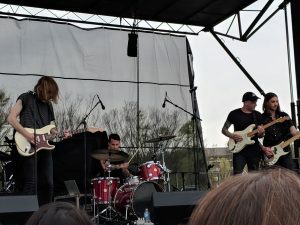 Some of the most exciting moments of CRUISR’s show was that they played some unreleased songs, which were a special treat for the Hofstra faithful. CRUISR’s unreleased tracks hyped up the audience, but the two leads jamming back to back peaked the excitement of the crowd. Required Radio contributor DJ LIV provided some mid-act entertainment. 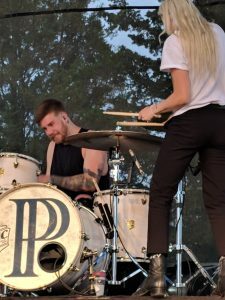 PVRIS was a fantastic act, and the student were really getting into the music and were incredibly engaged in the performance. PVRIS even came back on for an encore after their last song. Gunn also gave out some of her guitar picks, and Griffin threw his drumsticks into the crowd. All in all, Hofstra’s Spring Music Fest was the most exciting moment of this semester. It lived up to the billing of being a very hype concert and the feeling was that everyone who went went home satisfied. On this episode of Life’s A Pitch host Gabe Salzman goes over the biggest fantasy storylines this week. For more, keep it locked into Required Radio at requiredradio.com. Ever get tired of hearing the same music every day? I know me and my colleagues are. Everyday we listen to the same material on radio because, as we all know, money speaks for itself. And the sad reality is that if an artist or DJ doesn’t having financial backing behind their music, or at least a solid following, they have minimal leverage to present to a radio station. This has made artists and listeners look elsewhere for alternatives. Which is why I came up with the idea of starting Open Format Media. Open Format Radio is here to offer an alternative to your everyday radio misery. We will be offering a broad range of music from around the country, along with interviews with music artist and media influences. In the first episode of Coast To Coast Gaming, Susumu Araki speaks with tournament officials and competitive gamers about a local gaming regional called All or Nothing Gaming (AON). He then talks to them about what it is like running and competing in a gaming tournament during their Super Smash Bros Four tournament. Riveting interviews and amazing stories are afoot. Learn about NFL Player Greg Van Roten and his battle from undrafted free agent to playing on one of the best teams in the NFL.